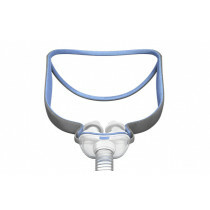 Nasal Masks provide apnea patients with continuous positive airway pressure (CPAP) for sleep therapy. Sleep apnea nasal masks deliver air to only the nostrils. This pressurized air helps keep the airway open to allow unobstructed breathing during sleep. 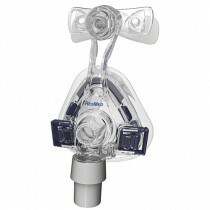 This type of CPAP mask is smaller in comparison with most of the other CPAP mask options. Coupled with its small size is its small footprint against your face. Many patients find the smaller footprint of the nasal mask more comfortable than other alternatives. The design of most nasal masks is a triangularly shaped cup that fits over the lower end of the nose. (See the above image on the left.) A silicone cushion comes in contact with the nose and face to form a pressurized seal. The soft cushion is comfortable to the touch. Some newer masks have a new design that employs a soft chamber interface directly below the nose. (See the above image on the right.) 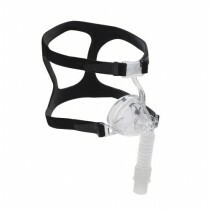 The air flow comes from the CPAP Hose to the hose connection and into the mask. The air flow continues up the nostrils to the patient's airway passages and on to the lungs. When the patient exhales, vented valves in the mask allow the expended air to pass out of the mask. In the image displayed above, there are five nasal masks. The first three are traditional styled nasal masks with a triangularly shaped cup with supports for the headgear to each side of the mask and with a frame that extends to the forehead for additional headgear support. This frame design helps stabilize the mask against the patient's lower nose. The fourth mask above is from ResMed and displays a newer design that does not employ a frame extension to the forehead. 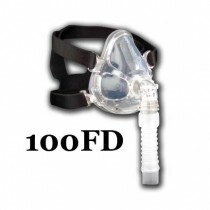 This modification makes the mask a suitable option for CPAP patients that experience sensitivity to anything touching or applying pressure to their foreheads. The last mask from Philips employs a design that avoids any contract to the forehead and nose bridge. It also offers minimal contact with the patient's face. This new nasal mask design is less intrusive and more comfortable than traditional nasal masks. Additionally, the tubing is routed above the head, keeping tubing away from the patient's face. Headgear for this mask is also minimized, making bad hair days a thing of the past. 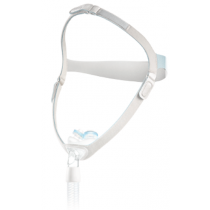 These varied designs give CPAP patients several options to choose from. 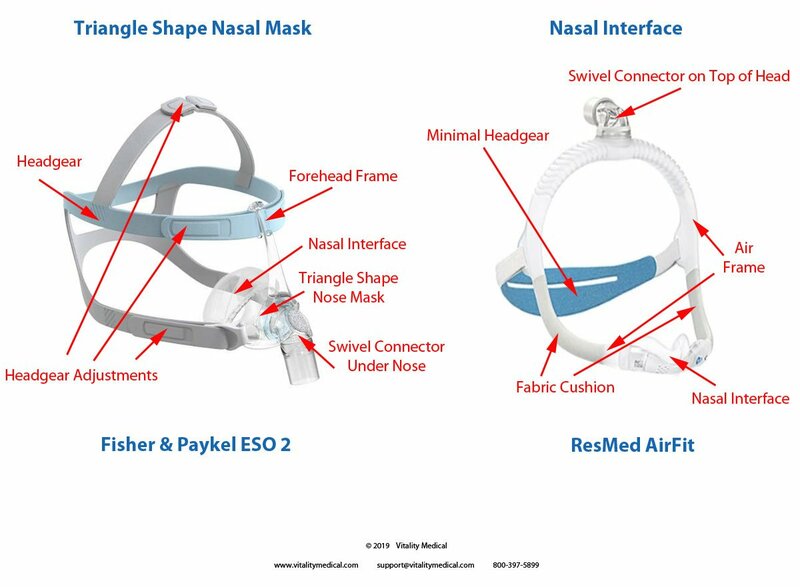 The major components of a nasal mask include the nasal interface, the frame, swivel hose connector, and headgear. 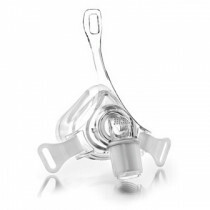 Although as already mentioned, newer designs are trending away from the triangular cup style nasal interface, this design is still a favorite of many CPAP patients. CPAP Nasal masks allow patients to breathe through their nose while sleeping. Proper fitting and adjustment of your nasal mask prevent leaks and discomfort. A properly sealed mask can help sleep apnea patients decrease their respiratory rate and lower their systolic blood pressure. The work of breathing for both inhaling and exhaling can be significantly reduced with a nasal mask. Many CPAP patients find the CPAP nose masks more comfortable than other mask alternatives, making it the mask with the highest degree of patient compliance. Which CPAP systems are compatible with nasal masks? 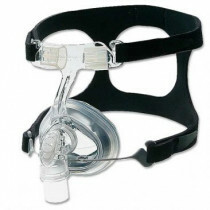 The nasal mask may be used with any CPAP Machine. 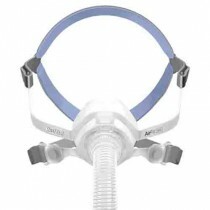 What is the best CPAP mask for side sleepers? Side sleeping is most comfortable with either a nasal mask or Nasal Pillow Mask. Can a mouth breather use a nasal CPAP mask? Yes, mouth breathing patients may use a nasal mask; however, it is not likely to be their best option. Mouth breathing patients should feel more comfortable with a Full Face Mask, Hybrid Mask or Oral Mask. The first two masks will support both mouth and nose breathing while the Oral mask supports only mouth breathing. What is the most comfortable nasal CPAP mask? One person's most comfortable is not necessarily another's. After all, comfort is largely associated with individual tastes. The Philips Respironics Dreamwear nasal mask is the top candidate for most comfortable. It is soft, unintrusive, offers minimal contact and minimal headgear. This mask is worth giving a try to see if it meets your personal comfort preferences. How often should you repace a nasal CPAP mask? Nasal masks should be replaced every 6-months to 12-months. Nasal cushions should be replaced every 3-months. How long does a nasal CPAP mask last? Similar to the question and answer above, nasal masks should be replaced every 6-months to 12-months. 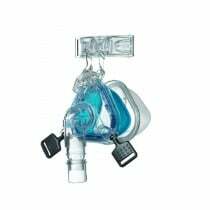 What is the quitest nasal CPAP mask? Having a quite mask is tied to getting a good seal and the quality of the exhalation port. The Mirage Activa LT provides a diffusion vent to disperse air gently and quitely. This design is top rate for decreasing CPAP mask noise. What is the best nasal CPAP mask? Currently the best selling nasal mask at Vitality Medical is the Mirage FX. 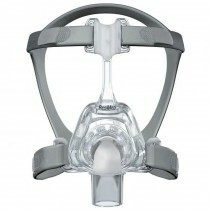 The most searched nasal masks on the Internet are the Dreamwear followed by AirFit N20. Reeves-Hoche, Mary Kathryn, Raymond Meck, and Clifford W. Zwillich. "Nasal CPAP: an objective evaluation of patient compliance." American journal of respiratory and critical care medicine 149.1 (1994): 149-154. Waters, Karen A., et al. "Obstructive sleep apnea: the use of nasal CPAP in 80 children." American journal of respiratory and critical care medicine 152.2 (1995): 780-785.